Tacos and quesadillas make for a quick and easy meal that offers a range of flavors and ingredient combinations. Here are the best Hello Fresh taco and quesadilla recipes for a fast and flavorful dinner no matter what you’re craving. 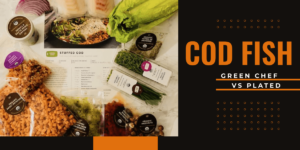 Tacos and quesadillas come in an endless variety of forms, and Hello Fresh does a great job of providing a wide array of options for their customers. 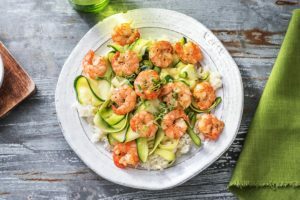 It’s not always easy to choose a meal when everything on the menu looks good, so we’ve gone ahead and done the initial work for you by providing our top five recipes right here for your convenience. 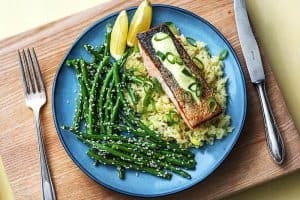 With Hello Fresh Tropical Fish Tacos, dinner can be on the table in 20 minutes, but nothing is lacking in this quick-prep meal. It starts with a mango slaw (complete with fresh mango and lime) accompanying a fresh fillet of tilapia. You can choose to cook the fish in the oven or on the stovetop, but either way, cooking is quick and easy. In the meantime, you’ll chop and prep the slaw, mix up a chipotle crema with sour cream and additional seasonings, and prep your tortillas. By the time the fish finishes cooking, the whole plate is ready—and mouthwatering! A plain chicken quesadilla sounds kind of boring, but with Hello Fresh Chicken Pineapple Quesadillas, the old standby gets a bit of refreshing. The recipe takes around 30 minutes to prepare, most of which is the actual cooking of the chicken, but you’ll be able to enjoy the quesadillas with a bit of cream and salsa on the side, too. Along with fresh flour tortillas and the juicy pineapple, you’ll find perfectly packaged chicken that’s refrigerated fresh. And although this dinner is quick, the combination of southwestern flavors with the sweet kick of the pineapple means there probably won’t be any leftovers, even if you have picky kids in your family. Chicken tacos are another family-friendly staple that gets an upgrade with Hello Fresh. The chicken stir-fry strips and apple cabbage slaw are a great combination that’s unexpected yet somehow works. And to top it all off, you have an easy to prepare lime crema for a bit of coolness and kick. At around 20 minutes prep time, the Fiesta Chicken Tacos are easy to make but definitely don’t taste like it! The dish carries a “spicy” rating, but you can easily leave out some of the Southwest spice blend if you prefer. Either way, the combination of flavors brings these tacos from boring to festive enough for an actual fiesta. Sweet potatoes probably aren’t the first taco ingredient most people think of, but it works here. 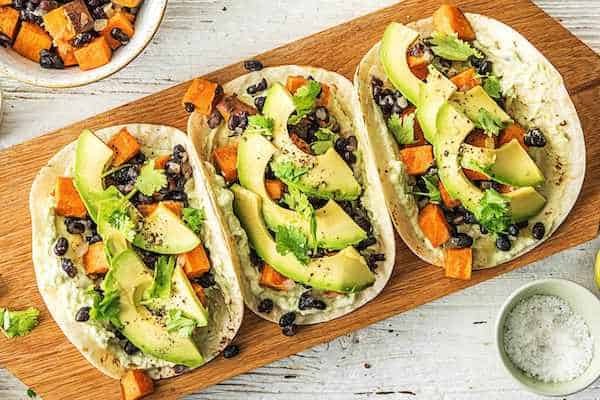 Hello Fresh combines sweet potatoes, black beans, avocado crema, and zesty cilantro for a dish that’s equal parts authentic and unexpected. Prep time takes about 40 minutes, given the time necessary to roast the sweet potatoes, but mixing the crema and assembling the rest of the recipe is straightforward. With fresh garlic, lime, avocado, and cilantro, the Hello Fresh recipe kit contains all the aromas to get you ready to savor these tacos the moment you open up the ingredients. 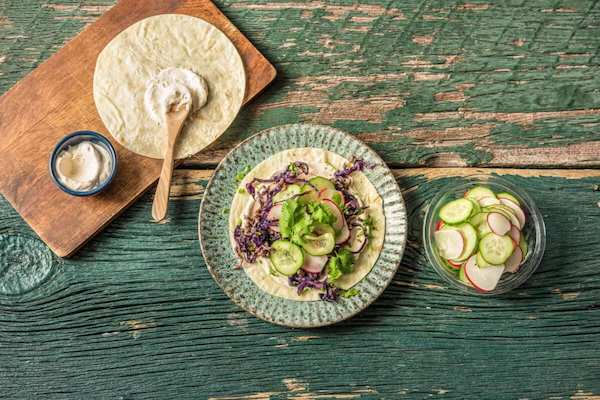 Another innovative spin on traditional tacos, Hello Fresh Sesame Beef tacos combine Korean-style sesame beef, quick-pickled vegetables, and a spicy crema for a departure from boring dinners! As unconventional as it seems, the use of chili flakes (gochugaru) in the filling livens things up, so you can expect this dish to be spicy if you use all the included spices. The recipe takes about 30 minutes to prepare and includes ingredients like 20 ounces of ground beef, shredded red cabbage, radishes, a Persian cucumber, scallions, sriracha, and soy sauce. First, you’ll slice the veggies and set them to quick-pickle with a combination of vinegar, sugar, and salt and pepper. Prepping the crema is quick—just stir together the sour cream and chili flakes, plus salt and pepper. Cooking the meat will take the longest amount of time, but only makes up half of the recipe prep time. In no time, you’ll have flavorful tacos that taste like they came straight from the local Korean takeout place! Whether you want something easy to prep or are craving a spicy meal, Hello Fresh meals offer tacos and quesadillas that will delight your taste buds but not keep you in the kitchen for hours. Whatever your taste—beef, chicken, or veggies—you can’t go wrong with a taco or quesadilla from Hello Fresh.